An organisation representing over 75 British craft specialists and makers has opened its first permanent retail space in a striking light-filled arts and crafts building in Mayfair. Following an online presence and two pop-up shops, The New Craftsmen has moved into a 19th-century building that was originally a workshop for makers of leather breeches. At 2,000 square feet, the space will host a range of work from makers across the country, with a schedule of rotating exhibitions, workshops and demonstrations aiming to engage visitors with craft skills and processes. "This is our new and permanent space – it is the third retail space we've had, but prior to this, they have been pop-ups, so I guess this is our stay-up," co-founder Catherine Lock told Dezeen. "Our ambition is for it to become a true hub for buying, commissioning, learning about and making fine craft," added co-founder Natalie Melton. "A permanent home means that we can establish a pace and a rhythm that falls in step with the very best makers – not rushed, nor hurried, but delivered with thought and consideration." Highlights in the first range of work on display include a new collection of hand blown Harbour Lights by Michael Ruh and Aimee Betts; Fabric Works, an exclusive collection of quilts from textile artist and natural dyeing expert Katherine May; and contemporary ceramic vessels from Silvia K Ceramics. In September the range will be given a refresh with a focus on work produced locally to the new shop in Mayfair. "We will be shining a spotlight on the craftsmanship within the workshops and ateliers of our neighbours as well as a few new surprises of our own," says Melton. "Our collection of products will continue to explore traditional craft skills against a backdrop of newness and innovation: redefining British craft." The main shop features large windows that flood the space with natural light, and features an indoor garden created by Hattie Fox from That Flower Shop. 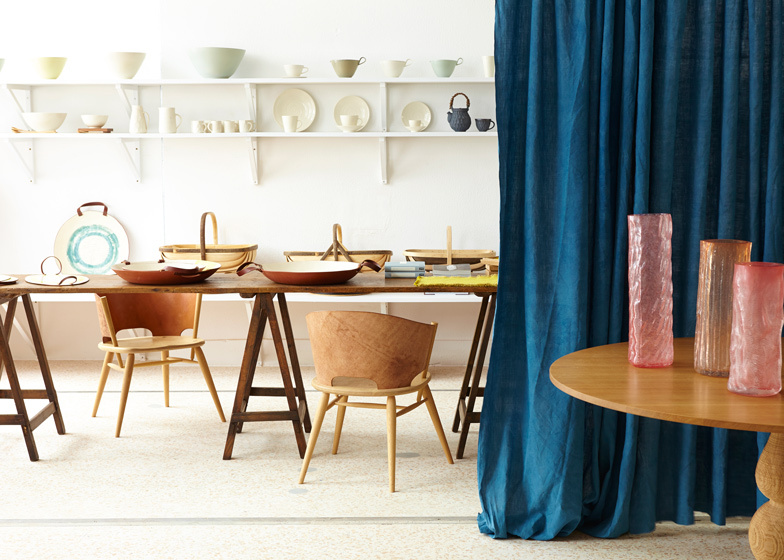 A large wooden table and a vintage tallboy, with a drawer for each designer represented by the organisation, form the shop's commissioning area dedicated to interior designers and clients who want bespoke pieces. The shop is located at 34 North Row, London. Other new spaces to open in Mayfair in the last year include Paul Smith's extended Albemarle Street store and a gallery space for auction house Sotheby's.